Healthy roadside vegetation just four months after the 2007 wildfires. California's hope for an uneventful 2007 fire season exploded on October 19th, as Southern California was ignited by massive wildfires. Fanned by Santa Ana winds in excess of 100 mph, thousands of acres of private and public property were soon destroyed. By October 21 damage was so severe and widespread that Governor Schwarzenegger proclaimed a State of Emergency in seven Southern California counties. On October 24, with the fires still raging out of control, a presidential declaration was issued for the fire ravaged areas. To ensure public safety and to allow access for emergency response, Caltrans closed many highways as the fires burned across the California transportation system. The difficult task of protecting the transportation system was already underway. Within hours of the news that fires were raging in Southern California, Caltrans Landscape Architecture Program jumped into action to develop and implement a strategy to reduce the risk of a second disaster – winter and spring flooding and mudslides. Contacting the affected Districts, they implemented an emergency response process for Landscape Architects in Southern California to work with their counterparts in the Maintenance Program. Caltrans District Landscape Architects immediately began to assess the damage of the highway roadsides with one goal in mind - to stabilize the land as quickly as possible before the winter rainy season to reduce the potential for erosion of hillsides on and off the state highway system. A rapid assessment process of post disaster hazards and emergency actions for immediate and subsequent impacts required efficient collection, processing and analysis of field data and conditions. Obtaining accurate mapping was critical to determine the extent of damage, estimate material needs and costs. Hydroseed application of native nurse crop along I-15 in San Diego County. Once the fires were contained, multi-disciplinary teams began to inventory and document damage to the highway roadsides. Rapid assessments were made to identify and prioritize immediate actions needed. 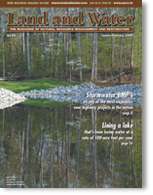 Emergency contracts were quickly developed to allow erosion control contractors to begin work without delay. The response was so rapid that some contractors were working on ground still warm from the wildfires. 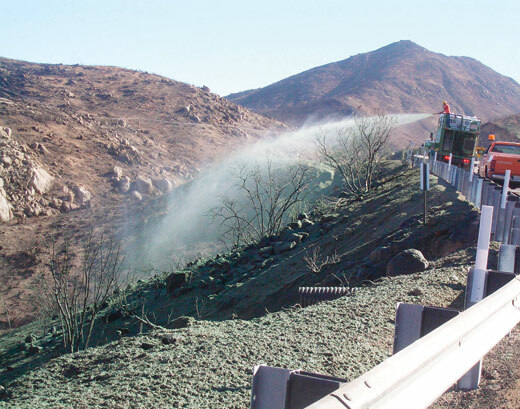 By October 30, 2007, Caltrans had $21 million dollars in emergency contracts with 15 contractors, replacing guardrails and installing erosion control Best Management Practices to stabilize the 150 miles of charred roadsides on 13 major highway routes. Realizing that cities, counties and private property owners would all be in desperate need of erosion control contractors and materials, Caltrans immediately began to contact suppliers and contractors to reserve labor, materials and equipment to respond to the massive work that lay ahead. With any catastrophic event there is an urgent need to identify and secure material, equipment and skilled labor to respond to the emergency. Addressing these needs quickly was to be a critical factor in the successful protection of the roadsides affected by fire. Basic economics of supply and demand can have a dramatic effect on the availability and cost of goods and services. Realizing that cities, counties and private property owners would all be in desperate need of erosion control contractors and materials, Caltrans immediately began to contact suppliers and contractors to reserve labor, materials and equipment to respond to the massive work that lie ahead. Erosion control seeds were identified as a critical limiting factor, as additional stock cannot be produced on demand. 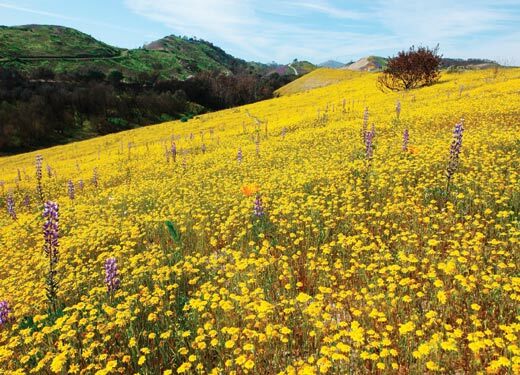 Site specific species were identified and several seed suppliers were contacted to earmark seed supplies for the restoration and stabilization efforts required for Caltrans right-of-way. An example of the scale of the roadside areas treated. Communication of real time information was also a critical item to address during this emergency response. Caltrans held weekly teleconferences to work with each affected District. This helped the Districts expedite the emergency contracting process by facilitating the flow of information between Headquarters and the Federal Highway Administration (FHWA). Caltrans Landscape Architects immediately began to coordinate their efforts with the Maintenance Program to ensure erosion control strategies were within FHWA emergency contracting requirements. If emergency work went beyond what was allowed by FHWA, that work would not be eligible for federal Emergency Relief funds and would have to be paid for with scarce state dollars. Since there was no guarantee Caltrans Headquarters would provide state dollars for continual communication and coordination between Landscape Architects, Construction Resident Engineers and Maintenance Major Damage Coordinators (MDC's), it was very important to ensure the scope of work was aligned with what the FHWA Reviewers agreed to in the field and what was reported on the Damage Assessment Forms. Emails proved to be the immediate response method to distribute timely information. In addition, Caltrans Landscape Architects used the internet as a resource for the Districts to assist in the emergency response. A web site was developed within a few days after the fires began. It was used to provide critical information such as contact information for erosion control contractors and material suppliers, GIS mapping of the burned areas, and information on the latest technologies and methods of erosion control. A rapid response, teamwork, and rain led to healthy vegetative cover. Post fire assessments in February 2008 demonstrated that the quick development and implementation of a response strategy was the key to success. The erosion control applications along with timely early season rains provided good vegetative cover that has successfully prevented erosion in the fire damaged areas. Caltrans Landscape Architects from southern California and Headquarters were critical members of the disaster response effort and provided exemplary, rapid assistance to the 2007 Southern California Wildfires. 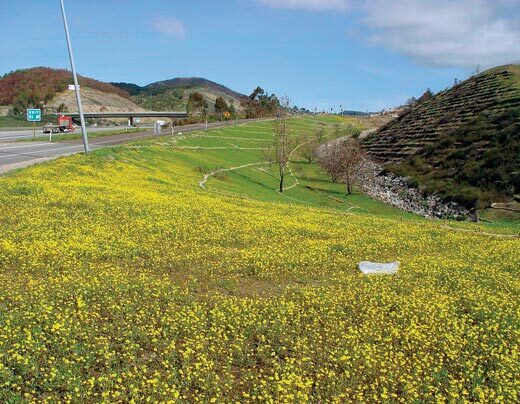 The collaborative team-work by Caltrans Landscape Architects, Maintenance and Construction personnel allowed erosion control contractors to be quickly hired and put to work implementing critical erosion control strategies. 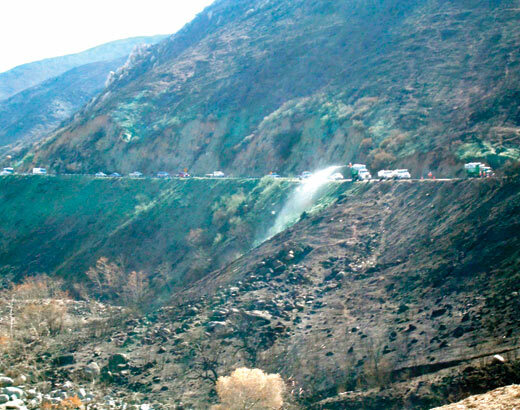 This effective disaster response effort avoided costly and dangerous mudslides on the 150 miles of damaged roadsides within the fire ravaged areas. For more information, contact Jack Broadbent, California Department of Transportation Landscape Architecture Program, MS 28, 1120 N. Street, Sacramento, CA 95814 at (916)653-3170 or jack_broadbent@dot.ca.gov.